On Thursday, Donald Trump gave a speech that invoked literally centuries of anti-Semitic conspiracy theories. While he never said the words "Jew" or "Jewish," anyone with even passing knowledge of these conspiracy theories recognized the rhetoric immediately. “We have seen this in the WikiLeaks documents in which Hillary Clinton meets in secret with international banks to plot the destruction of U.S. sovereignty in order to enrich these global financial powers, her special interest friends and her donors," Trump warned, before explaining that the "corporate media" is also part of the conspiracy. There's even a whiff of the "Protocols of the Elders of Zion" in the mix, with the claims that WikiLeaks has some secret document proving the conspiracy. Which hasn't, to be excruciatingly clear, happened, since there is no conspiracy. On WikiLeaks' Twitter feed, the hints are even less subtle, with an Oct. 7 tweet reading, "Hillary Clinton in private Jewish speech 'Saudis have exported more extreme ideology than any other place on earth.'" But while the fever swamps of white supremacy from which Trump increasingly seems to draw inspiration have continued the multi-century hate tradition of accusing Jews of secretly running the world, 21st-century reactionaries have focused their paranoid fantasies on another religious group: Muslims. Right-wing media, depending on how mainstream an outlet is, runs the gamut from dark insinuations to outright accusations that a cabal of radical Islamists is conspiring with government officials to subvert the United States. That's what conservatives are stabbing at with all the chatter about the supposed spread of "sharia law." This conspiracy theory mostly centers around Barack Obama. Huge numbers of Republicans will happily tell a pollster that Obama is a secret Muslim: It was 43 percent in a CNN poll, 54 percent in a Public Policy poll and 30 percent in a Pew Research poll. But as Obama's secretary of state and now as the Democratic nominee for president, Hillary Clinton is typically included in these conspiracy theories about secretive Muslim cabals. 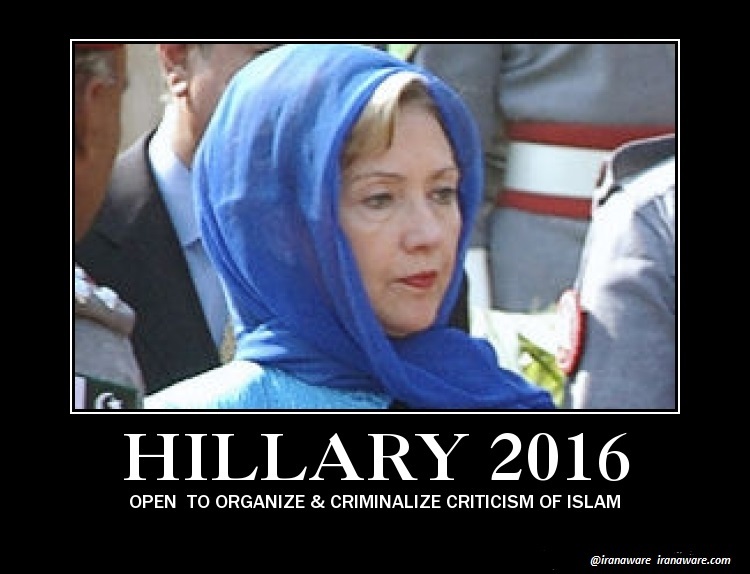 While conspiracy theorists don't accuse Clinton herself of being a secret Muslim (though they do occasionally like to imply it by sharing pictures of her wearing head scarves while traveling in Muslim countries). Instead, they tend to cast their eyes in the direction of Clinton's longtime aide and friend Huma Abedin, who has been subjected to accusations of working for the Muslim Brotherhood as a double agent for years now. Huma Abedin, Mrs. Anthony Weiner, Mrs. Huma Weiner, she is Hillary Clinton’s No. 1 aide. And Huma’s mother is best friends with the new First Lady of Egypt, the wife of the new Muslim Brotherhood guy, Morsi. That’s really all you need to know. But there’s much more to know. That’s why Hillary is out celebrating the brotherhood. That’s why Hillary is joining Obama in telling the military to give it up for the Brotherhood guy. Because Huma’s mom, there’s actually a group, the Muslim Sisterhood, essentially, that is an offshoot of the Brotherhood. And Huma’s mom is best friends with the new so-called First Lady of Egypt, who is also a member of the Sisterhood. Folks, it’s Peyton Place. It’s too much to keep up with. As Nina Liss-Schultz of Think Progress noted, Limbaugh is pulling this out of "conspiracy theories being reported by conservative media outlets" that "cite no reliable sources." Abedin — who is Muslim and lived in the U.S., Britain, and Saudi Arabia growing up — is considered an expert on Middle Eastern politics. Her father, now deceased, and mother both had long careers as academics. Abedin is an odd choice of a target for right-wing conspiracy theories positing that fundamentalist Muslims are infiltrating the U.S. government with the goal of imposing sharia law on us. Abedin is glamorous and cosmopolitan, and has worked her entire adult life for Hillary Clinton, one of the most famous feminists in the country. Abedin is married to a Jewish man, former congressman Anthony Weiner, and even though that marriage is not working out, it's not because of religious differences. Abedin's mere existence stands as a rebuke to right-wing bigotry that denies that Muslims can fit into pluralistic, Western democracies. Perhaps that's why so many conservatives hate her so much, and are determined to accuse her of having some secret agenda that her liberal politics and Jewish husband are meant to conceal. In 2012, a group of the most deplorable members of Congress — including Rep. Michele Bachmann, Rep. Louie Gohmert, Rep. Lynn Westmoreland and Rep. Trent Franks — sent a nasty letter to the inspector general of the State Department, accusing Abedin, then working as deputy chief of staff to Secretary Clinton, of having ties to the Muslim Brotherhood. As Rep. Keith Ellison said at the time, the accusation was rooted in "a bizarre game of Six Degrees of Separation." "She mentions that her father, who has been dead for two decades, knew a guy who knew a guy who knew a guy who was connected to the Muslim Brotherhood in some unspecified way," Ellison added. But that, of course, is how these nutty conspiracy theories work. Sen. John McCain and then-House Speaker John Boehner took the unusual step of defending Abedin against her accusers. McCain described the attacks as "nothing less than an unwarranted and unfounded attack on an honorable woman, a dedicated American and a loyal public servant." Glenn Kessler of the Washington Post has also done a thorough fact-checking of these claims and agrees that "the connections are so tenuous as to be obscure." Of course, none of this does diddly-squat to convince the crazies. All it does is convince them that Republicans like McCain and Boehner are turncoats and probably in on the conspiracy, along with Obama and Clinton. Since then, it's become an article of faith on the paranoid right that Abedin is working for the Muslim Brotherhood and therefore Clinton answers to them, unwittingly or not. (Though most seem to think Clinton's in on it too.) Take, for instance, this conversation between Family Research Council vice president Jerry Boykin and anti-Muslim pundit Frank Gaffney on Gaffney's radio show. “What is the state of the penetration of our government, not just by the Huma Abedins and the Hesham Islams of the world, but more broadly as evidence of the civilization jihad that’s being waged against us by the Muslim Brotherhood especially?” Gaffney asked Boykin. “What we do know is that there are penetrations at every level of our government, to include Homeland Security, to include the military, to include the intelligence community, to include the Congress,” Boykin answered. Both Gaffney and Boykin are avid Trump supporters, so it's no surprise that Trump himself has started to invoke this conspiracy theory on the trail. By the way — check, take a look at where [Abedin] worked, by the way, and take a look at where her mother worked, and works. You take a look at the whole event. But in the case of Anthony Weiner, she’s married to a guy that’s uncontrolled, and uncontrollable. He’s a sick person. And you know she has access to classified information. Huma Abedin has access to classified information. How Hillary got away with that one, nobody will ever know. This is typical Trump: He often doesn't spell out a conspiracy theory so much as allude to it and hope that his audience will run to Google and search fringe right-wing sites to figure out what he's talking about. George Zornick at Mother Jones has argued, "Trump is likely referring to the fact that Abedin was once listed as an assistant editor at the Journal of Muslim Minority Affairs, which is edited by her mother. The Abedins’ employment at JMMA was the subject of a recent New York Post article, which tarred the journal as a 'radical Muslim' publication." In reality, as Kessler of the Washington Post writes, it's "a staid academic journal" with a small circulation at fewer than 600 libraries. Most of it is research work on Muslim life around the world. Some articles are conservative and some are not, but that variety is typical of academic journals, which often exist to serve free discourse more than to promote specific ideologies. "Oddly, the New York Post described the journal as a 'Saudi propaganda organ' — even though the Saudi government has banned the Muslim Brotherhood as a terrorist organization," Kessler adds. "Presumably one cannot be both a Saudi propagandist and a Muslim Brotherhood operative at the same time." This contradiction is easy to mow over for conspiracy theorists, however. Trump is a man who can pivot from hinting that Muslims are secretly infiltrating the government through Clinton to making a speech accusing Clinton of being controlled instead by international bankers and the media, code words that have long been used to accuse Jews of running secret conspiracies. Is the secret Muslim conspiracy at odds with the secret Jewish one? Are they in cahoots? What does Anthony Weiner have to do with all this? We'll never get a straight answer from Trump or his minions, I imagine, but we'll probably get our fair share of dark hints over the next few weeks.